The main “liquid monument” is one of the historic ramparts most international city in Switzerland. In 1886 a society dedicated to pumping and supply working at the edge of the lake, decided to escape the water at night to reduce the pressure in the pipes of the city, because water demand was much lower than during the day. Thus, a jet of water gushed from a few meters vertically and helped unpack. 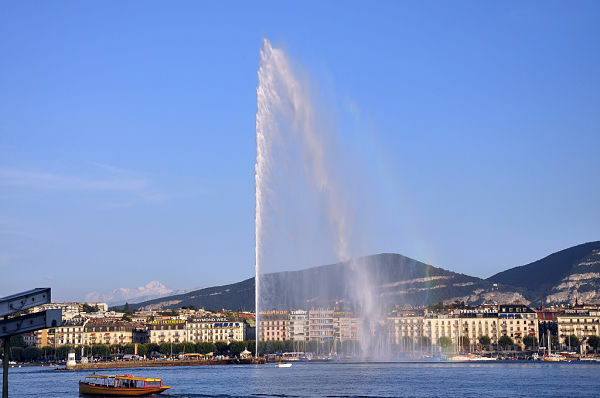 This original need, the idea became a reality 1891, when the city of Geneva decided to install the Jet d’Eau (name of the jet in French) in the harbor, accompanied by electric lighting, but not until 1930 when it was inaugurated officially.